When I was home in New York over the summer, I had a standing Monday lunch date with my dad and sister. Although our lunch dates were nothing new, this summer they took on new purpose: We would eat a burger a week and decide which was our favorite. I’m not entirely sure where the idea stemmed from, but once we set our minds to it we stuck to the plan. For eight Mondays. That’s probably about as many burgers as I eat in a whole year. There wasn’t anything scientific about our “research,” we just went where we felt like going. 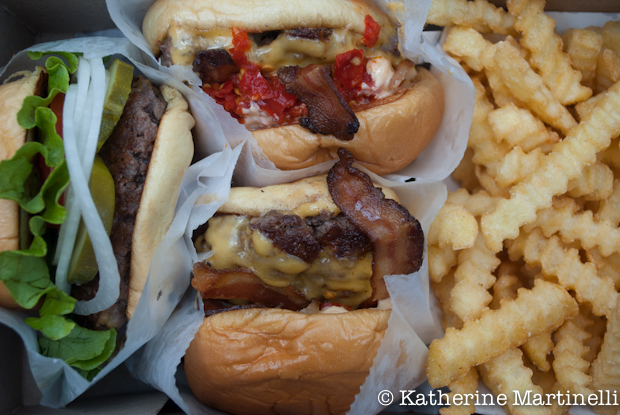 We ended up mostly in Greenwich Village and Williamsburg, and missed lots of great burger joints. My dad, sister and I had differing opinions on lots of the burgers, and agreed whole-heartedly about others. Price came into play a bit, but mostly we were interested in taste. Is it a juicy, flavorful burger? Is the bun fresh, and does it stand up to the burger? In the end it all came down to personal taste, and whether or not the place was having a good day. Again, the results are far from scientific, but it was a fun summer project. This is the place where it all began. It’s a well-known “secret” that Peter Luger, Brooklyn’s famous steakhouse, serves a half-pound, prime beef burger only during lunch. We’d been talking about trying it for ages and finally went for a belated Father’s Day lunch. We resisted the dry-aged steaks and went straight for the burgers. I got mine with cheese and bacon but wouldn’t necessarily recommend the bacon for the burger – it’s a big slab on the side that, while delicious, doesn’t add anything to the experience. I thought the burger was great, but my dad found it to be a little dry. 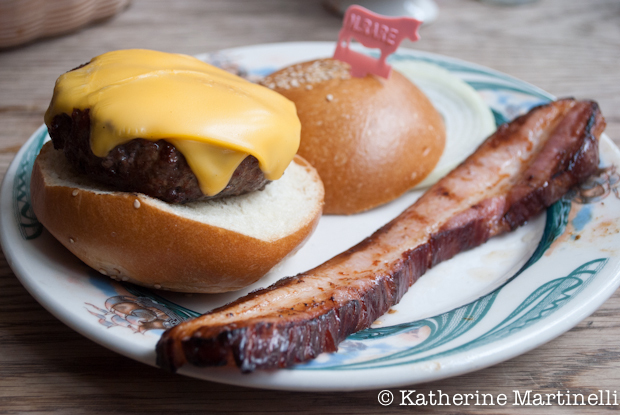 April Bloomfield’s The Spotted Pig in Greenwich Village usually gets mentioned in any round-up of best burgers in New York (and even in the US). Eater even described it as one of “15 epic New York burgers to eat before you die.” It’s made with a special Pat La Frieda blend of beef and chargrilled, but I don’t think there was any way to live up to that hype. And at $20 it better be mind-blowing, or at least amazing. It does come with Roquefort (no substitutions) and a big pile of thin and crispy rosemary shoestring fries, but for my money the burger was just ok. My dad, who had it with the cheese (I went without), enjoyed it. Maybe I was expecting too much. Price: $20, includes Roquefort cheese (no substitutions) and a huge pile of rosemary shoestring fries. My dad had heard from someone in the neighborhood that the White Horse Tavern had a cheap and great burger. So we headed to the local haunt, famous as a beatnik and bohemian hangout in the 1950s (it’s been around since 1880) where Dylan Thomas supposedly died. Indeed, at $7.25 for a burger with fries or $7.95 for a cheeseburger, it’s one of the best burger deals in town. My dad liked it, but my sister and I found it lacking – greasy and bland, and the bun fell apart. I still love the place, just not for the burger. This sweet, upscale casual restaurant in Williamsburg was my sister’s pick, and a great one. I’d been to Dressler, the restaurant’s fine dining sibling, and had been wanting to try DuMont. Although they also have another restaurant (DuMont Burgers) devoted entirely to burgers, we opted for the pretty back garden of the restaurant. Their burger has also gotten rave reviews, and rightfully so. We all liked their juicy and flavorful burger, and the bun was one of my favorites. Great fries too! Next time I would skip the cheese as it didn’t add anything to the burger in this case. We’d all been to Shake Shack, Danny Meyer’s famous fast food burger joint, plenty of times, but it felt wrong not to include it. So we made the short trip up to the original location in Madison Square Park on a beautiful summer Monday and stood in line for 20 minutes or so, waiting to place our order. We don’t know if it was a particularly good day, or if we were just enjoying the overall atmosphere in the park, but one bite in and we all knew that these burgers had won in a landslide. The buns (Martin’s potato rolls) are soft and slightly sweet, but hold up to all the fillings of the burger. While my sister got a regular, plain burger and loved it my dad and I splurged for the SmokeShack, which includes cheese, Niman Ranch all-natural applewood smoked bacon, chopped cherry pepper relish and shack sauce. Instead of having too much going on every component just sang in one beautiful chorus. Can you tell we were smitten about this burger? Oh, and the fries are good and the shakes, well, amazing. I’d been to Five Guys before and liked it, but after Shake Shack it was just a sad comparison. I do enjoy that grilled onions and mushrooms are included, and it’s a big burger for a reasonable price. But as my dad said, especially with pickles on the burger it just felt like a greasier McDonald’s. There aren’t enough napkins in the world to wipe all the grease off you after eating one of those. A “little hamburger,” by the way, is big enough. Even the fries, which they take pride in (there’s a board telling you where the potatoes are from each day) were not good – they had that raw taste in the middle. Although it’s been through a few owners and chefs in recent years, August has remained one of our favorite neighborhood restaurants. It’s cozy and comfortable with solidly good food. Which is why their burger was so disappointing. It was dry and flavorless, and the bun did nothing for me. And at $16 it was one of the more expensive ones we tried. Go there and eat anything else though. We had to end at Corner Bistro, which has probably held the record the longest for the best burger in New York. My dad had a not so great burger there before we started our adventures, but I’m always a defender of Bistro. It was my hang out for many, many years, a home away from home in a Cheers type of way – yes, the bartenders knew my name. I knew that their food – a simple and short menu of burgers, grilled cheese, chicken sandwich, BLT and chili – was hit or miss. But I’ll love it always. 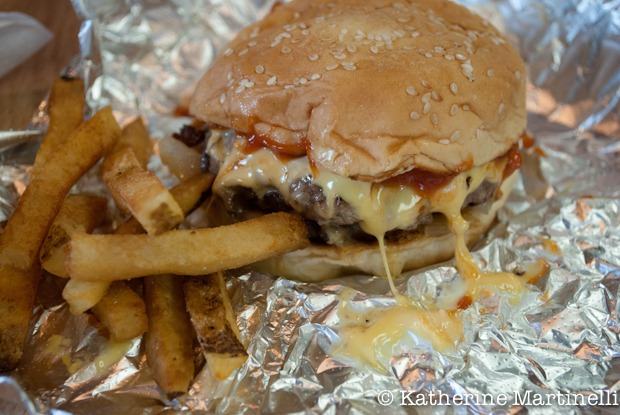 Luckily for us on that particular day the Bistro Burger – piled high with American cheese and bacon – was perfect. Served on plastic plates with no frills, it was flavorful and juicy and well deserving of its burger fame. Yes, we missed lots of good burgers, but there were only so many weeks in the summer, and so many burgers I could eat. 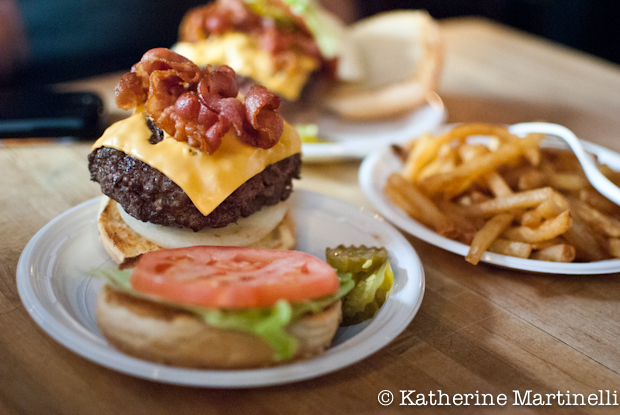 Where’s your favorite place to get a burger, in New York or anywhere? Hmmm, can I place an order right now? 2 of everything, please, right now, and I mean NOW, (LOL) to our house. Thank you. Simply delicious. This is a really fun roundup! It’s been ages since I’ve lived in New York – and the next time I’m there I won’t be looking for a burger! – but this is such a fun experiment. In fact it’s one my wife and I do on an ongoing, informal basis here in St. Louis – we’re assembling our personal list of “best” burgers. Well, if we were in NYC we might try Shake Shack – I’ve read such great things about it, and your experience confirms to me that this is a great place. 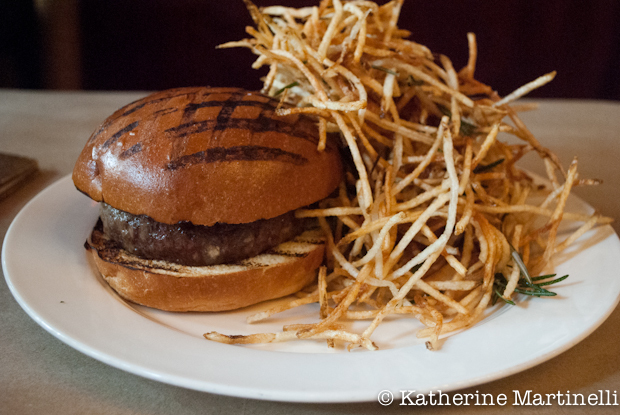 I wouldn’t want to pay the price for the burger at the Spotted Pig, but those fries look heavenly! Super fun post – thanks so much. 😀 Thank you, If I ever get to NY Shake Shack it is. Love the idea of a weekly father/daughter lunch…how special for all of you! And now I’m obviously craving a burger! Ohhh, that’s a minute away from where I work…I’ll have to check it out! Mmmm Have you tried Bare Burger? Love all their sauces for the fries and the meat options for the burgers are taaaaaaaaasty!!! 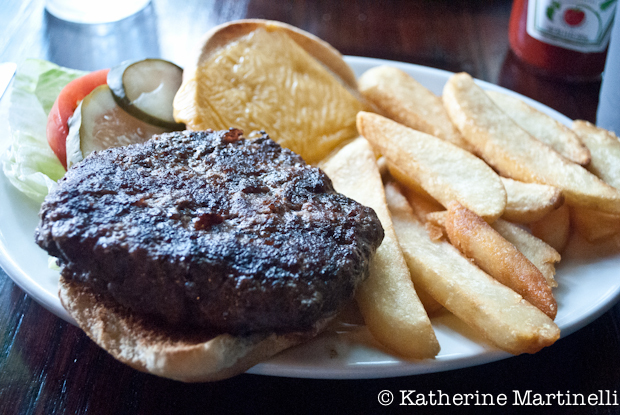 I <3 Peter Lugar for their steaks but I've never tried the burger. What a fun date to have all summer! Oh my god this is an amazing post Katherine, I shouldn’t come at this hour though, I’m getting huge cravings right now! Love this post. We’re hoping to go to New York in the spring, so I already know where were going to get a cheap, but tasty lunch. We’re headed to Shake Shack! Interesting that it’s the cheapest burgers you all had, but the best; while the most expensive, seemed to have been the least enjoyable. It may not have been scientific, but it appears that you all were quite discriminating in your judgements. Thanks!!!! I am so picky about my burgers and honestly you should totally try my burger LOL! 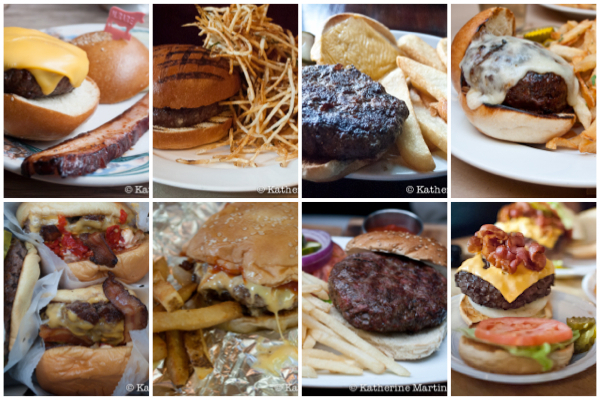 Thanks for these suggestions…i am always on a look out for a great burger! What a fun family project!!! I love how you documented each with a photo and description 🙂 Now I’m hankering for a burger! PS…came by to copy your gnocchi recipe. Hope to make it tomorrow. I had the opportunity to go to 5 Guys this summer but got sick before I could go. I’m still so bummed I didn’t get to try it. You have now made me hungry. And I’m suppose to be going to bed. 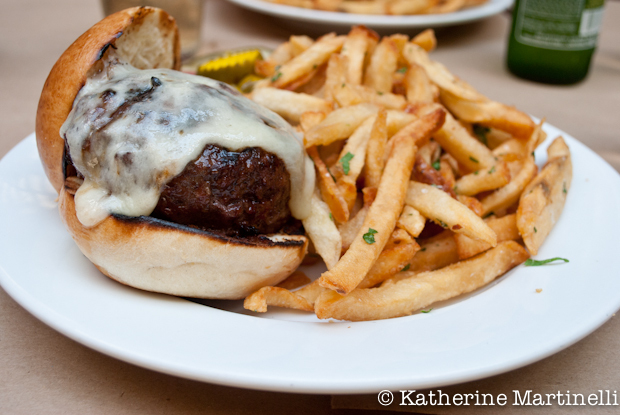 Try the Lamb Burger at The Breslin Bar, or the burgers at Molly’s Shebeen. There’s also Schnipper’s and Lucky’s. What a great post! I am definitely in agreement with you… after years of sampling some of NYCs best burgers, I always find myself coming back to good old Shake Shack. There’s just something about their blend of meat, soft, buttery rolls and tangy Shack sauce that I can’t resist. 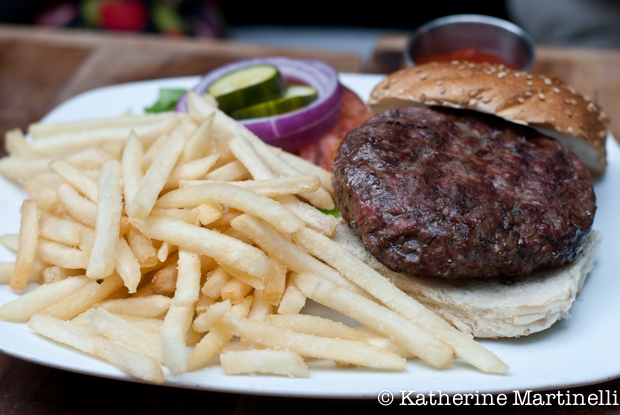 If you’re looking to splurge a little, check out the Black Label burger at Minetta Tavern. At $26, I doubted it could live up to the hype but it did! It tasted like a high quality, dry aged steak on a bun. It was so good, it didn’t even need any ketchup! awesome post. I have been to a few before. You rate shake shack so high! I must go there one day. I walk by it all the time, but timing has never been right for me. Corner bistro also looks yummy.